Before learning how to draw fairies: some fun facts before starting sketching! Some believe that a four leaf clover could give the owner the ability to see fairies! Many false stories did involved fairies at the beginning of the 20th century. Welcome to this fictional lesson on how to draw cartoon fairies! To make a short description of a fairy, just think of a cute girl with wings and little pointed ears. It's pretty basic. But you understand how they should look like! The one on your left is rather original with her delicate wings (2), tiny waist (3) and small feet (5). Once again, the shape of this adorable fairy is compose of several rectangles and circles to form the body and irregular shapes to create the wings. Notice how the little antennas all over her body are helping to give a more eccentric look to our little creature! In this example, we will draw a very simple fairy in action! First draw the head and the body, and then add the arms. Continue your creation by sketching the wings and the feet. You can add a magic stick and draw some details on the head and the body! Put some colors and enjoy! 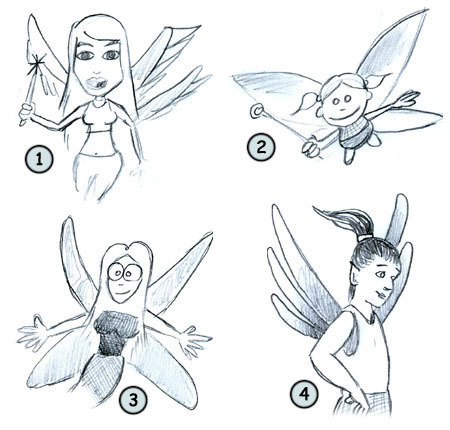 Like all previous lessons, you can always try to sketch some fairies with a "cartoonish" style (2) (3) or try a more realistic one (4). Unleash your creativity and create fairies using the basic elements like the ears, the wings and the magic stick... and don't forget to put a little imagination too! Congratulations! Now you know how to draw some cute fairies!